Volunteers are a huge part of what helps the YWRC to be successful. Some of our most influential volunteers are those that join a committee. Since we are frequently asked about what it’s like to be on a committee, we’ve decided to answer some of those questions and feature one of our hardest working teams this month – the YWRC Gala committee. This YWRC Gala committee is a crucial part of the planning of our largest fundraiser every year. This group provides a significant amount of support to our small staff. Our committee started back in September and has been working hard since to make sure this event will be a success. One of the main responsibilities of the committee is the silent auction packages. Committee members started brainstorming unique packages last fall. 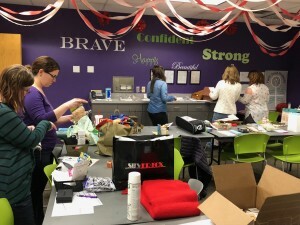 They began reaching out to local businesses and supporters in November to request item or experience donations, and have continued to follow up over the last several months. And, earlier this week, they helped us put all of the packages together. Needless to say, auctions are a team effort! In addition to the auction, our Gala committee also helps us determine the event menu, location, décor, centerpieces, awards process and run-of-show. We are grateful to have such a dedicated, passionate and thoughtful group working with us to ensure we’re able raise funds to continue our critical programs. 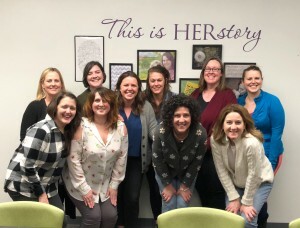 This year’s Gala committee is comprised of: Virginia Barrette, Katrina Beery, Amy Beck, Marilynn Cedarstrom, Jess Crawford, Rhonda Elming, Laurel Howell, Erin Johnson, Jenna Thompson and Megan West. Our fearless co-chairs and emcees are Maria Volante and Georgette Longnecker. A huge THANK YOU to the Gala committee for all of their dedication over the last seven months in preparation for our event in April. If you’d like to join us at the YWRC Gala, or learn more about the event, you can visit our event website here. What YWRC committees can community members join? How much time does it take to serve on a YWRC committee? Most of our committees meet once a month or every 6-8 weeks. The time members spend volunteering outside of meeting times depends on the committee and time of year. For example, YEP plans a family-friendly event every summer which leads to an increase in volunteer time in the months leading up to it. The committees listed above are open to adult community members who have time and skills to share – you do not need to identify as a woman to volunteer. Depending on the committee, we may complete a background check before a member joins. This is especially important for those who may work with our clients. Why do you have committees? Volunteer committees allow us the opportunity to learn and collaborate with our community members. They also provide a great deal of support to our small staff, which allows us to put more of our funds to direct programs and services. The ability to have groups of individuals with different backgrounds, perspectives and skills is an invaluable resource. Are you interested in joining a committee? Send us an email or give us a call at 515.244.4901 to get more information. Note that our committees do have a member capacity, which may impact your ability to join right away. We hope you have enjoyed learning more about our committees. We welcome any other questions you may have as well (comment below or send them via email.